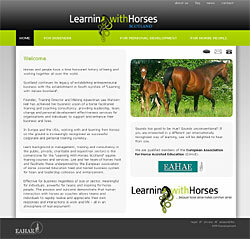 EAHAE International Member: Learning with Horses, Lee Watson Hall. Set in the heart of Robert Burns Country, next to the world famous golf courses of Troon, Learning with Horses Scotland helps businesses, individuals and horse people realise their potential by gaining a true insight into who they are and how their behaviour is perceived by others. This is a precious gift horses naturally give when they interact with people. Horses judge you not on the car you drive, your title or your bank balance. They judge you based on how much they can trust you, how open you are and how you behave towards them them. They read body language accurately and mirror your behaviour right back at you without fear or favour. Their survival is based on their ability to live in the moment, add this to their honesty and ability to read human body language accurately and we get the opportunity to learn, make changes and immediately experience the benefits makes changes brings. At Leaning With Horses, explore different ways of thinking, different leadership styles, better define your strengths and strengthen your weakness, work more effectively as a team, build better relationships .Its fun, gets you back to nature and best of all it really works.